Paul Jorgensen whips a pass downcourt for Butler. Jorgensen tallied 13 points in Butler’s 80-57 win against DePaul on Feb. 3. Photo by Jimmy Lafakis. Butler picked up their fourth straight Big East win on Feb. 3 in an afternoon matchup against DePaul. The 80-57 win bumps the Bulldogs’ season record to 17-7, while the team is 7-4 in conference play. Kelan Martin scored 19 points in the first half en route to a 26-point performance. The senior also picked up a team-high six rebounds and six assists. A strong defensive front dismantled DePaul early on by forcing 23 turnovers for 27 points. Defense has been key to Butler’s success as of late. St. John’s Shamorie Ponds (19.7 ppg) and Marquette’s Andrew Rowsey (19.5 ppg) were both limited to a combined two points when playing the Bulldogs. This time around, it was Max Strus (17.8 ppg) who scored just seven in Hinkle Fieldhouse. As a team, DePaul shot 38 percent from the field and just 25 percent in threes. Butler led for the majority of the game and were up 40-30 at halftime. 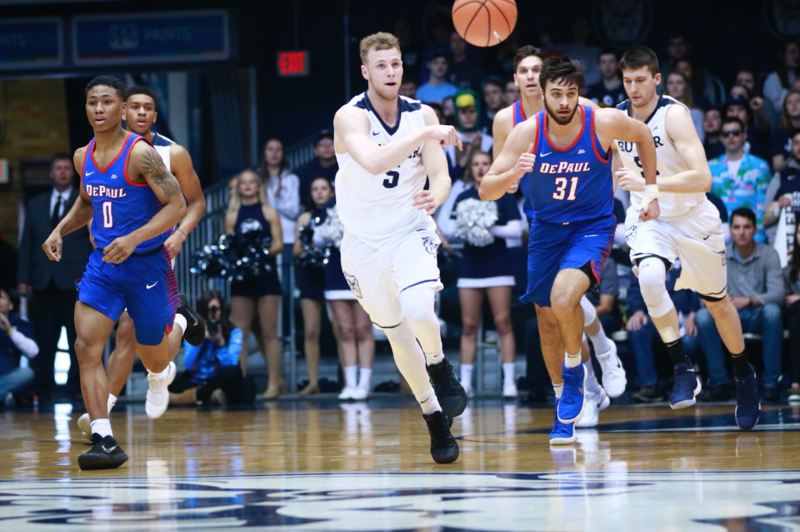 The Bulldogs shot 41 percent from the field and 44 percent from the 3-point arc to outscore the Blue Demons by 13 in the second half. Four players scored in the double-digits. Paul Jorgensen collected 13, followed by Kamar Baldwin and Sean McDermott with 10 each. Walk-on Campbell Donovan scored his first career three with less than two minutes remaining. Next, Butler hosts Xavier on Feb. 6 at 6:30 p.m.